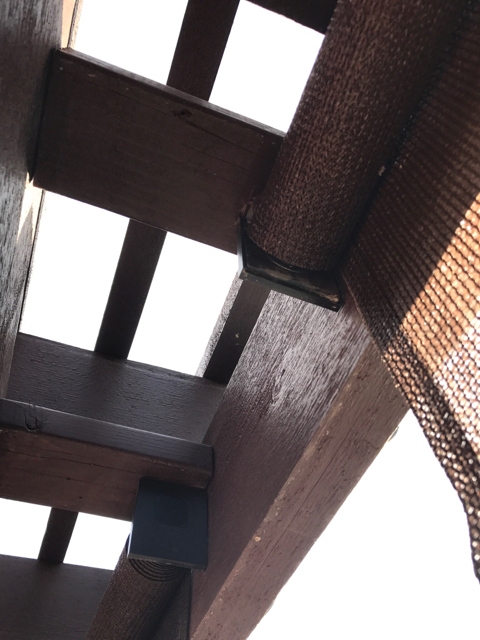 We have a pergola that I want to put outdoor curtains on, either tab top or grommets (if they are rust resistant) to increase our shade. While I would LOVE to get Sunbrella or Coolaroo fabric this year, I'm just not able to spend $100+ per panel right now (need 4), plus buy the rods. I'm hoping to get some inexpensive panels to make do for this year and maybe next year (or however long they last) and get some decent rods that won't rust. I'm willing to pay for good rods as I really only want to buy and put them up once. Anyone have experience or recommendations? Everyone at the lake uses roll up bamboo blinds. They will last 4-5 years from what I've been told. I never did understand the whole point of a pergola for "shade" with an open top...............but they look nice! Tarp that rascal! Do you just need to like block one side where you get the most sun from? Lattice? I've seen folks use canvas tarps from the paint aisle at Lowes. With a grommet tool you can have some decent curtains on the cheap. was going to suggest the same as pooldv.. canvas dropped cloths from the paint aisle are a very popular DIY option.. 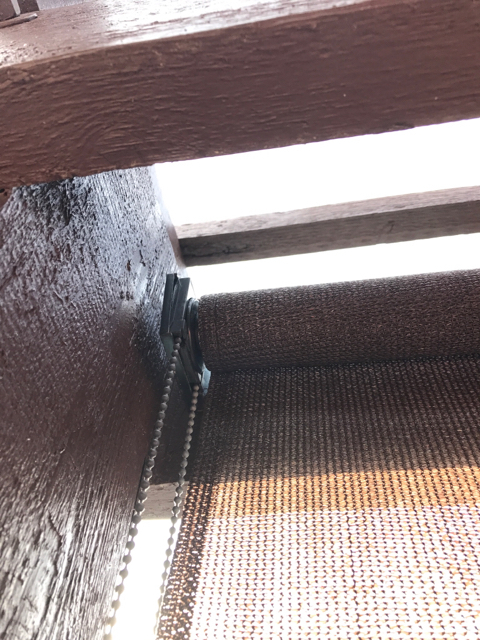 The paint drop cloths work good and look cool - and you can get a cheap brass grommet installer - tool and brass rings at Harbor Freight for like $10. This way you could put brass rings in the top for a rod or better yet - a piece of stainless or steel cable. Also if you are really handy you can sew a hem into the bottom and top and make them look very stylish. I used these drop cloths from Home Depot in the past. And my husband used some type of plumbing pipe to make my outdoor curtain rod on our porch. They worked well, but they do fade/fray and need to be replaced each season. Plus: then you can then reuse them as drop cloths. If they are in a spot where they get wet, they will mildew which is impossible to remove. I have had these outdoor curtains for the past 2 years. I like them better than the drop cloths. A couple places sell them, so check around for the lowest price. They come in various colors, tab top or grommet and various lengths. Whichever curtains you chose, you will want them a tiny bit short (i.e., "floods" and not sweeping the ground). They will get dirty, stay damp and fray from blowing back and forth if they drag or touch the ground. At my old house, I once used a a few fabric shower curtains with a tropical pattern to enclose part of a hot tub area for changing. They held up unbelievably well considering what a cheap solution they were. They come impregnated with a water repellant and mildew resistance. I see a bunch of Sunbrella type panels on Ebay all the time. Im planning on ordering some that are $29 for a 50 x 84" panel. I love all the great suggestions!! Thank you all! Unfortunately, tarping the top isn't the fix. We get the sun shining through the south and west sides, hence the need for a curtain/shade of some sort. I have family arriving in 2 1/2 weeks, so not enough time is available for me to DIY something right now. Just need something I can put up ready made. I'll look into the bamboo shades and check out eBay. Can you share who the seller is? We built a covered 10x10 space on our deck. There is room for 5 plus tv/xbox. We bit the bullet on Sunbrella and have not looked back. Four panels on the west side work great. Three years and still in new condition. Punched a small hole in the bottom corner to screw in a metal hook. Used bungee cords to hold them in place...they can flex a little in the wind. 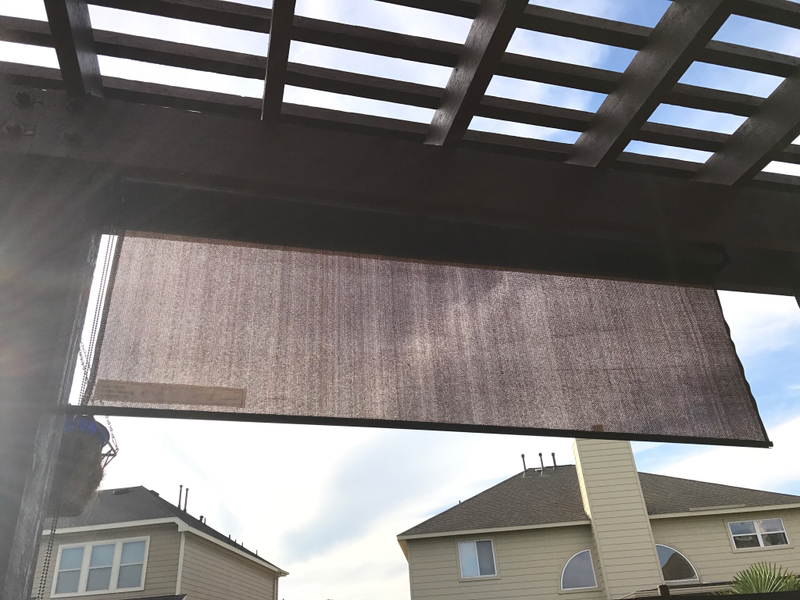 Just saw some great outdoor curtains at a reasonable price at improvementscatalog.com. Coolaroo shades are the bomb.dot.com!!! We love ours on our screened porch. Generic cream colored ones can be found in somewhat standard sizes at Lowes sometimes, or special order directly to Coolaroo for colors or sizes. We special ordered ours to get the color we wanted and they were back in 3 weeks or so. VERY well made. Thank you! I'll take a look! Thanks, Maddie! I may end up going that route. Good to know you like yours! Have you had any difficulty with them melting in the direct sun? I saw a review with pictures of large melted holes in the shade supposedly from constant direct sun. How do you have yours mounted? I think I would rather have mine mounted to the underside of the beam than on the face. Is this possible? Got pictures of your shades in use? We got ours from Home Depot and they have worked well! We've had them for quite some time. Other side we added a 2x4 to mount.